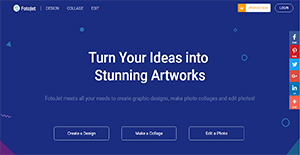 FotoJet is a no-cost web-based graphic design, photo collage, and photo editing tool. With this application, artists, designers, and other individuals are able to create art in a matter of minutes. With FotoJet, users can rest assured that they are utilizing top-notch design tools. The application is designed by PearlMountain Limited, an organization that is dedicated to creating easy-to-use and powerful photo editing tools for the use of people worldwide. Moreover, using FotoJet is not time-consuming. The app does not require registration prior to use nor is there any software that needs to be downloaded. Designers can immediately access the platform’s rich pool of graphics templates and resources and achieve artworks with a professional touch. FotoJet is a user-friendly graphics designer and photo editing tool. The application makes it simple to create gorgeous artworks with a professional touch. With this, users are able to design collages, posters, cards, banners, and more in a matter of minutes. On top of that, the platform gives them access to free services such as Pixabay and OpenClipart so they can further beautify and personalize their design. FotoJet’s free-to-use design tools are immediately accessible. Users are not required to register to use them nor is there any software to download. This makes it an effortless and time-saving application since designers and individuals can skip registration and instantly get to work. At the same time, FotoJet enables non-professional graphic designers and photo editors to create high-quality graphic designs and turn boring photos into attractive, appealing images and collages. The application works fluidly on all major browsers and you don’t have to install anything to run the software, saving you time, money, and space on your internal servers. FotoJet comes with plenty of built-in templates and resources. These can be further expanded in the upgraded and paid version of the app, but the freemium service itself already offers rich design tools. Additionally, FotoJet seamlessly integrates with Pixabay and OpenClipart. This way, users are not limited to utilizing photos and cliparts on the app and on their local storages for more enhanced FotoJet designs. With FotoJet, users are able to create stunning artworks with little effort. The application is equipped with powerful tools that allow artists, designers, and casual users to come up with elaborate designs in a short time. What Problems Will FotoJet Solve? FotoJet resources are either free or premium. Users who upgrade their accounts to FotoJet plus are able to access premium content such as templates and resources. This also allows them to create artwork they can use for commercial purposes as long as they hold the copyright to the resources they used. If you are considering FotoJet it could also be beneficial to analyze other subcategories of Best Digital Asset Management Software collected in our database of B2B software reviews. Since each enterprise has specific business wants, it is advisable for them to desist from searching for a one-size-fits-all perfect software system. Needless to say, it would be useless to try to find such a system even among market-leading software solutions. The smart thing to do would be to list the various important aspects that need consideration such as main features, finances, skill levels of staff members, company size etc. Then, you should do your groundwork thoroughly. Read some FotoJet reviews and look into each of the other apps in your shortlist in detail. Such in-depth groundwork can ensure you reject ill-fitting applications and zero in on the solution that provides all the aspects you need for business success. How Much Does FotoJet Cost? We realize that when you make a decision to buy Digital Asset Management Software it’s important not only to see how experts evaluate it in their reviews, but also to find out if the real people and companies that buy it are actually satisfied with the product. That’s why we’ve created our behavior-based Customer Satisfaction Algorithm™ that gathers customer reviews, comments and FotoJet reviews across a wide range of social media sites. The data is then presented in an easy to digest form showing how many people had positive and negative experience with FotoJet. With that information at hand you should be equipped to make an informed buying decision that you won’t regret. What are FotoJet pricing details? What integrations are available for FotoJet? If you need more information about FotoJet or you simply have a question let us know what you need and we’ll forward your request directly to the vendor.